Used 2010 Chevrolet Express Cargo Van AWD 1500 135" for Sale in St. 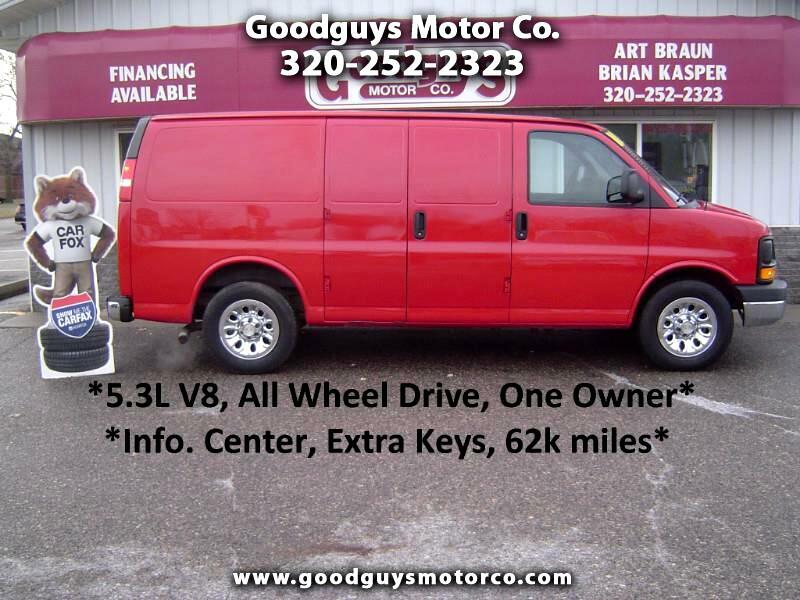 Cloud MN 56301 Goodguys Motor Co.
2010 Chevrolet Express Cargo Van AWD 1500 135"
2010 Chevy Express 1500 AWD Cargo --, All Wheel Drive, One Owner, Extra Keys !! This One-Owner Chevy van has been fully serviced at Goodguys Motor Company and is ready to hit the road. Features include: 5.3L V8, automatic transmission, air conditioning, AM/FM/CD stereo, daytime running lights, auto headlights, tilt wheel, cruise control, info center, traction control, Cloth interior. Also included is a 30 day or 1,000 mile Powertrain warranty (work must be done in our shop). Don't let this one pass you by.. Give us a call or stop in for a test drive!!! Vehicle Inquiry for 2010 Chevrolet Express Cargo Van AWD 1500 135"
Message: Thought you might be interested in this 2010 Chevrolet Express Cargo Van.